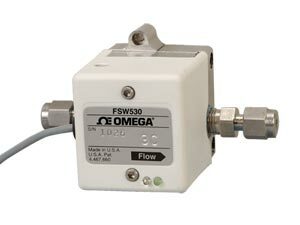 The FSW530 Series flow switches are capable of detecting extremely low liquid flow rates from 13 mL/minute up to 10 L/minute with a full scale switch accuracy of ±1.0% or better! A wide variety of fluids may be measured. Repeatable results are achieved using a patented pelton-type microturbine wheel. This proven design has been providing precision results since 1988 and has developed a well deserved reputation for continuous operational service for many years without failure. Because of the compact size and economical cost of these products, the FSW530 models are suitable for a wide variety of industrial, commercial, laboratory and OEM applications. Some sample applications include high/low alarms for hydrocarbon fluids, fuels, light oils, solvents, coolant, pesticides, mild acids, alkalis, and de-ionized water. Either plastic or metal construction may be selected. To order optional EPDM O-rings, add suffix "-EPDM" to model number, add $50 to the price.